Refer a friend and earn a $100 credit! Your referral can earn you a $100 credit to be used towards your security services, products – even upgrades. 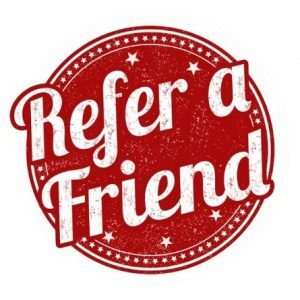 Your referred friend will also receive a $100 credit for use towards their own security services as well! The backbone of our business is our happy and satisfied customer base. Most of our new customers are clients who’ve been referred to us by friends who already enjoy our security services. 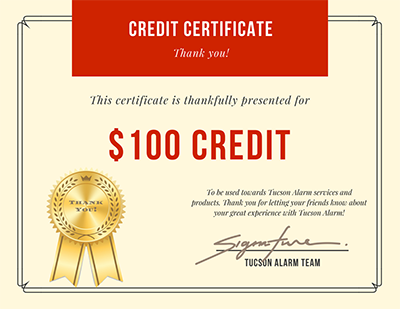 For this reason, we’ve created our customer referral program as a way of showing appreciation for all those customers who are spreading the good word about our security services in the Tucson. For each referral you give that results in the sale of a new monitored security system, we will automatically credit your account with $100 to be used towards services or new products and upgrades. Plus, the new customer whom you referred to us will also receive $100 credit as well! Within sixty days of your referred person’s services start date, you will find your $100 credit has been posted to your account for use. To take advantage of this offer, please fill out the form to the right of this page or give us a call with your referral information. There are no limits to the amount of people you can refer or how many $100 credits you can earn. We hope you enjoy our referral program – it is simply our way of saying THANK YOU.